If you’re here, you might’ve already read our other article where we explain the benefits and attributes of bamboo bath towels compared to cotton bath towels (if not, you can find it here). Bamboo towels offer an array of quality attributes that certainly better the quality of your post-shower time in the bathroom. There’s nothing like a comfortable and soft towel to dry up water from your skin! It is important to keep your eyes peeled for any fake bamboo products if you’re on a hunt for the perfect bathroom towel. Low-quality blends and towels crafted with poorly harvested bamboo will surely mean a world of disappointment to you. Don’t worry; we’re here to make your job easier! We’ve reviewed the top choices as we looked to identify the market’s best bamboo bath towels and we’ve determined that the Bamboo Bath Towels by Brooklyn Bamboo are our top choice for a 100% bamboo towel. Having said that, there are many cotton/bamboo blends that combine the advantages of each fabric. If you aren’t ready to commit to a totally cotton-free bath towel, we suggest the Premium Bamboo Cotton Bath Towels by Ariv Collection come out on top in the “best attributes” race for a blended fabric towel. Continue reading below to check out our whole review before making a purchase. Are you looking for bigger towels? Don’t worry – we’ve got your back! 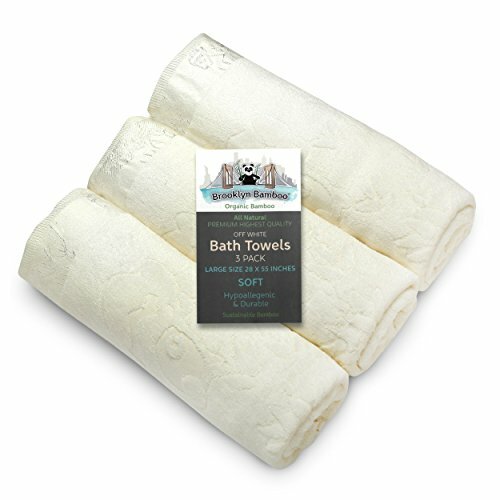 If you are looking for something larger than a standard bath towel, we’ve also reviewed bamboo bath sheets here to save you some time. 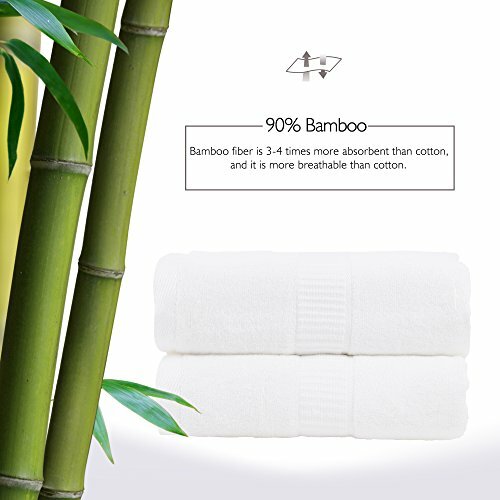 Bamboo fiber’s quality: As we mentioned above, low quality bamboo fabric will almost assuredly result in a poor experience with the towel. Even if the product is well crafted, the fiber’s quality will dictate how durable and comfortable it will be, and how fast it will be able to dry your skin. Some products are also made with 100% organic bamboo which is another factor that will affect price and something to consider when shopping for bath towels. Absorbent capabilities: Let’s face it; this is probably the most important attribute that you should look for. The main objective of a towel is to dry us out as quickly as possible, and doing so in one or two attempts should be achievable if you own a quality towel. Keep an eye for products that look like they can dry you out quickly, without repetitive rubbing! Softness: Few things are as uncomfortable as drying your skin with a product that feels coarse or rough. A well-crafted bamboo towel should feel soft whenever it touches your skin. It doesn’t matter if the towel is purely made of bamboo or you purchase a high-quality blend: softness should be prioritized whenever making a purchase. Size: Most of the towels we looked at were large (averaging 27″ X 55″) which is the typical size you’d expect for a large bath towel. If you are looking for wrap up in a larger bamboo bath sheet, we’ve got you covered here with our top picks in that category. This towel by JML is is our value pick for the price. A purchase of this product will get you a couple of high quality bamboo towels, but beware: even the manufacturer warns that they become very heavy after absorbing water. The towels are soft on touch and absorb water pretty quickly – definitely a good option to consider. Keep in mind that like any other bamboo towel, it requires special care when washing it – otherwise you might see some snags coming off the product. Follow the manufacturer’s instructions and you should be good to go. Surprisingly, you get two towels for a price that most companies would charge you for a single one. Considering their quality… that seems like a pretty good deal! You get two towels with each purchase – a great deal for its price! The size should feel just right – they aren’t incredibly large, but they aren’t small either. Very heavy after absorbing water – this makes them uncomfortable to handle after each use. If not treated very carefully, some threads might start to come off sooner than you would expect. These bath towels by Brooklyn Bamboo are soft but very thin. You get a set of 3 with your purchase and they come at an even cheaper price than JML’s product. It’s definitely a very appealing offer to consider, but they aren’t perfect. Unlike many bamboo bath towels on the market that are made of a blend of bamboo and cotton (sometimes only a small percentage of bamboo) these towels from Brooklyn Bamboo are 100% organic bamboo. There is one main issue that could keep you from buying them, though: threads seem to pull off rather quickly, which could prove to be highly inconvenient. We noticed that this shouldn’t happen too often though, so don’t worry! Although thin, the towels are pretty big and they absorb a surprisingly large amount of water for their thickness. The product’s quality seems way above its price tag, which is what every buyer often looks for. Thin towel that manages to absorb a surprisingly big amount of water. Feels soft and doesn’t damage your skin. High-quality bamboo fabric offers owners an enduring accessory. Certain washing machines seem to pull threads off the towels after just a few washes. If you own a rough washing machine… please, keep this in mind! They might be a bit too thin for some people. We’ve decided to include a bamboo-cotton blend to prove a point we made in our comparison article. A well-made blend of this product often results in a very high quality towel, and Ariv Collection certainly aims for that with their Premium Towels. The towels come in a pretty big size (they’re not as big as bath sheets, though) and they offer a comfortable feeling of softness when pressing it against the skin. Considering they are made 70% from cotton, you’d expect them to be priced cheaper than their full-bamboo counterparts, and that’s exactly what you get. In each order you’ll get a set of 4 towels, you can choose from the manufacturer’s color selection. Well-crafted blend of bamboo and cotton gives you a high-quality product for a very affordable price. The sizing is great if you like above-averagely sized towels. They’re soft, they dry quickly and they come in different colors. They might shrink after washing them, which could be highly inconvenient. Could feel a bit too light for some people. The Premium Bamboo Cotton Bath Towels by Ariv Collection is our top pick as it offers a fine blend of bamboo and cotton, allowing you to purchase them cheaper than other towels solely made of bamboo while also keeping a high quality standard. They could be exactly what you’re looking for if you need to buy larger sheets. On value pick is the one by JML with a good balance of price and quality. If you are looking for your first truly 100% bamboo bath towels but don’t want to splurge on the price, our budget organic pick is the 3 piece set by Brooklyn Bamboo.